That top rung is small in the wider world but in schools with students beyond the early elementary years it should be 100%. In schools [like PDS, ( and like St. Gregory)] getting engaged, being creative and collaborating is not an optional activity. And technological innovation makes it possible to engage with a global reach. And if we believe in the importance of innovation and creativity, making a positive contribution and changing the world – there is the purpose. It brings a whole new meaning to the eduspeak catch phrases of problem-solving and ethical and creative thinking. It makes our mission possible in effective, dynamic and inclusive ways. I have written here often that 21st century schools educate, empower, and enable students as publishers– that they should be asked to share their content with a wider audience, and use the many new technologies available (like wordpress!) to do so. Our students at St. Gregory are blogging, but still primarily within the walls of stgregoryschool.org domain; it is my intent we find ways to broaden the reading audience for their publishing. It takes more than collecting data or creating on computers to be a 21st century school. If educators are not having students publish regularly in thoughtful, authentic, and relevant places they are NOT preparing them for today or tomorrow….The authentic publication of student work should be a part of EVERY SINGLE UNIT OF STUDY. If an educator can’t figure out a way to help students publish anything in a unit of study they need to either 1) Rethink the unit or 2) Rethink the assessment. While data in an expensive database may be impressive to educators, leaders, and test prep companies, it is not intrinsically meaningful for students or helping them in an authentic way. Read the book I tell you and write a book report which I will read and hand back to you with some comments. Some papers will end up in the trash and some our bulletin board. Join our class online learning network where you will join a group based on the book you are reading. 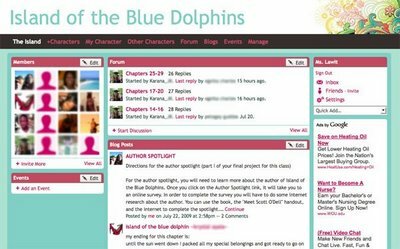 You will select a character from the book whose profile you will take on in the learning network. In the network you will create your profile page, engage in discussions and contribute blog posts as if you were the assigned character. Thank you for those really kind and generous words. Your blog is a source of great inspiration and admiration. And I always love it when we seem to be on parallel tracks. (You are usually well ahead of me!). And talking of nings – our PDS ning has been taken up by middle schoolers. And now we adults are jumping on board and exploring the potential for furthering professional learning collaboration. Thank you for sharing the message of “Publish It Teaching!” that I wrote about in my blog. I hope to learn more about how you and your readers continue to engage in and this type of teaching. I invite you to share your successes with me and my readers/followers by posting successes on my blog or notifying me via Twitter or Facebook.